While Austin is full of seriously fantastic food in all cuisines, I keep returning to Hopfields, and am starting to have seriously warm and fuzzy feelings about it being my place to grab dinner or catch up over a beer. Located just north of the UT campus on Guadalupe Street, Hopfields is an incredibly beautiful space that serves classic home-style French food, and is known for its unique bar with delicious craft cocktails, hand-selected wine, bottle service and more than 40 beers on tap. The front bar room has a nice family-style dining space that is first-come, first-served with a large bar to try their variety of libations. Toward the back of the space, more traditional dining seating is available in pocketed rooms that provide an intimate feel for conversation. The large dining room gives off a romantically masculine vibe with lots of mood lighting and deep colors and textures surrounding you&apos;lI really feel that the tone of the space adds to the experience of your meal! I&apos;ve been known to sit around for a few hours in conversation over a drink (Port of Havana is my favorite), or to stuff my face with their fantastic frites with garlic aioli dipping sauce. 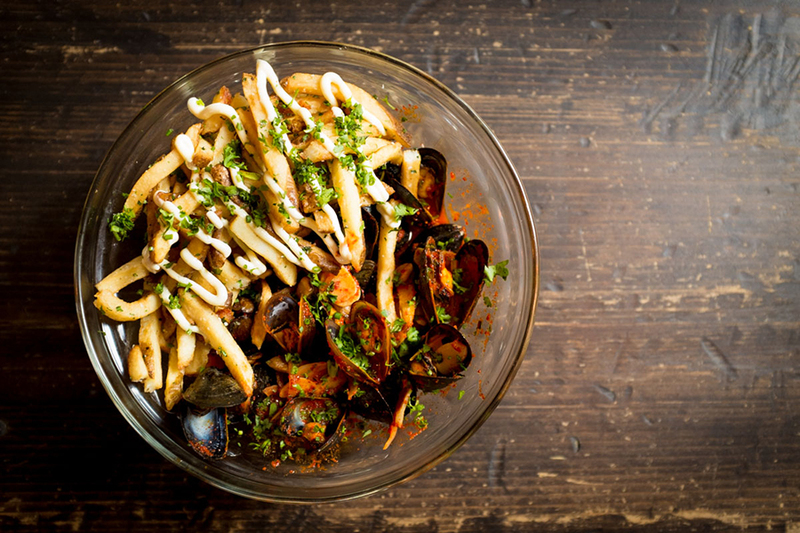 If you&apos;re hungry, I recommend splitting the beautiful bowl of Moules Frites, which includes PEI Mussels, white wine, shallots, chili flake, garlic, frites and more of that sigh-worthy aioli. There are also regular specials incorporated to the evening menu, which you can usually find out on their Facebook page or by calling ahead! If you&apos;re in town and looking to experience a more authentic Austin neighborhood bar and dining scene, you won&apos;t find something as quaint as Hopfields so close to downtown. Stop by, grab a beer, and feel what it&apos;s like to be an Austinite. Show us your best cocktail pic @VisitAustinTX!